This is not my garden gate unfortunately, but one I noticed while out walking in the countryside this month. It immediately reminded me of the children's book The Secret Garden by Frances Hodgson Burnett. Having shown you a glimpse of the garden I had to show you what was behind the door, didn't I! The blue flowers were Camassia. I have never seen them planted in this way before. Back into my garden and the borders are full of spring flowers. The mix of tulips I bought from Sarah Raven - this is the third year they have reappeared. This is a perennial honesty plant Lunaria rediviva we bought from East Lambrook Gardens two years ago it has been very feeble until this year when it has created quite a show. 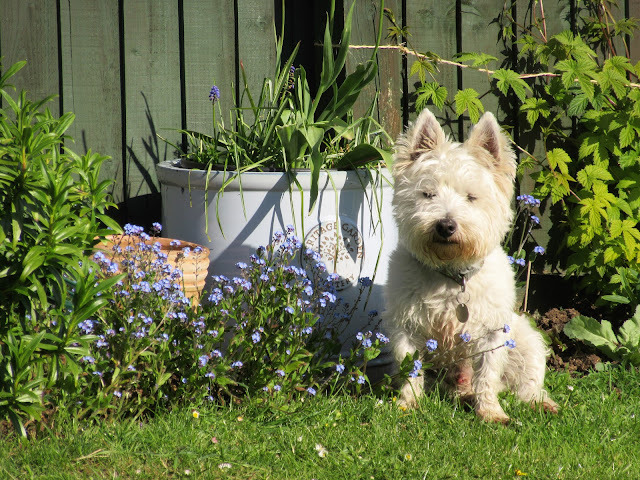 Tavi posing amongst the forget me not and the annual hop plant! The leaves on the grape vine on the pergola has just started to open. We have had a cold snap this week and vineyards in France and England have tried to protect the vines by lighting up candles hopefully it worked and the crop will survive and produce a good crop later in the year. Luckily living by the sea it is milder and we don't have to revert to such drastic measures. 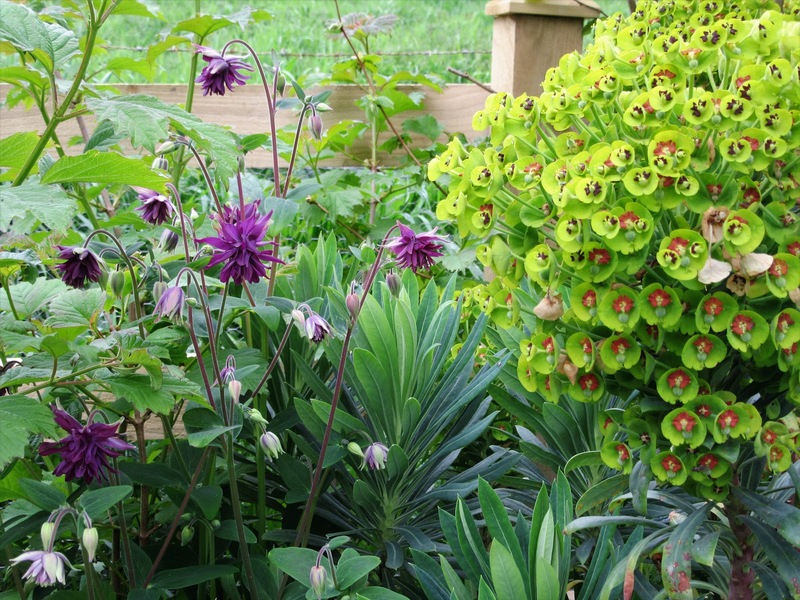 Favourite plants of the month include Aquilegia (Granny's bonnets) and Euphorbia Wulfenii , the pink blossom from the step-over apple cordon. Geraniums feature strongly in the garden, one of the first to appear is the small purple flower at the front is know as Mourning Widow or Geranium phaeum. The white honesty is still flowering in profusion - and Tavi has got into the picture again, at least he was looking quite white for a change! and displayed in the home too! The fruit border is also full of promise and the green house is full of seeds, dahlias and tomato plants. Looking back at last months post it is amazing to see how the plants have come on. Today we have seen some rain, the first for about five weeks. It was a welcome sight as our three water barrels ran dry towards the end of the week and it was even enjoyable to sit tin the conservatory and listen and watch the rain! 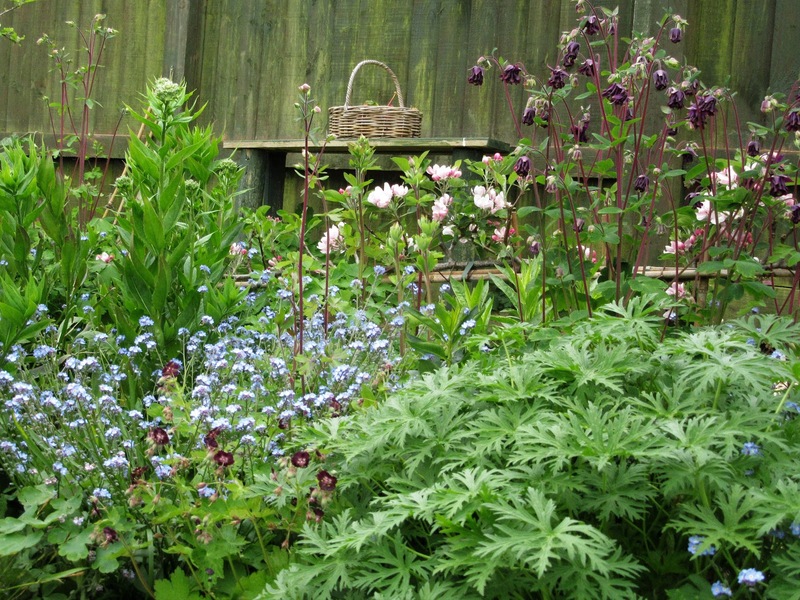 What is your favourite plant in your garden at the moment? 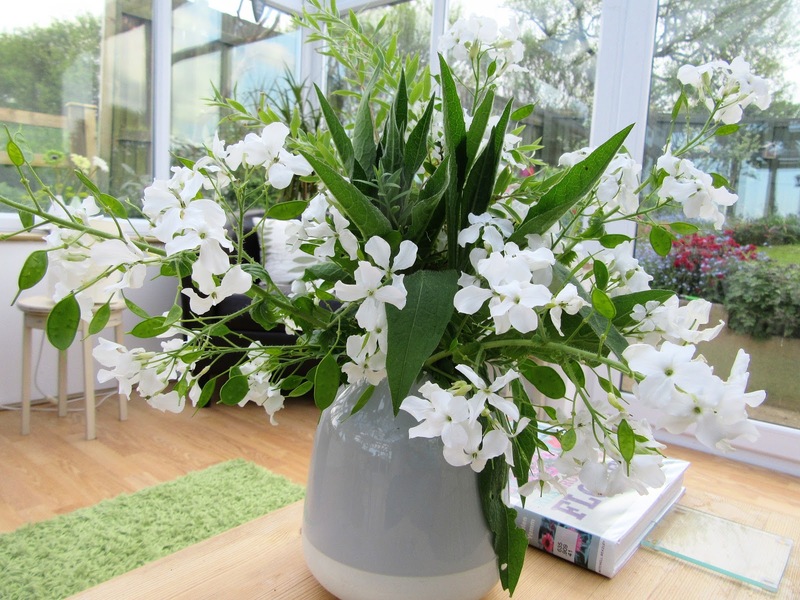 Hi Sarah, my favourite plant in the garden at the moment is apple blossom. 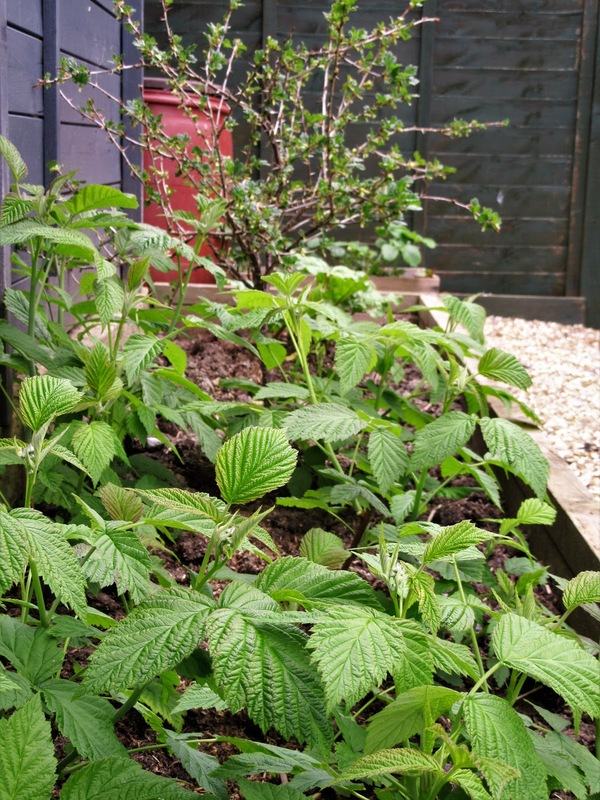 I've prepared a post with some pics of my garden which is coming along nicely. Your garden looks beautiful. I love the garden gate and especially what's behind it! Have you read Toms Midnight Garden...kind of reminds me of that too. Yes I have read Toms Midnight Garden several times it was one of my favourites. That lavender grey on your garden furniture sets off all garden colours! Absolutely beautiful garden! It reminds me of the book "The Secret Garden" with all the colors of Spring. We only have a few of the early Spring Flowers growing now. It's too early for us here in North Dakota to plant things yet. We can still see a bit of snow in corners when we drive around in the country. Tavi is for sure cute! I love the white honesty, I only have purple. I love the gate too, I have a thing about gates, I take pictures of them. 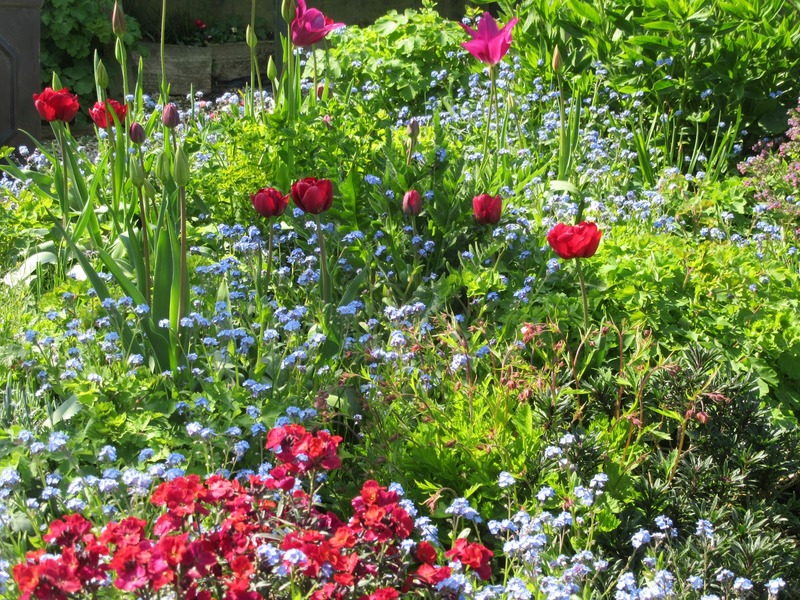 Your garden is absolutely sublime! I do love the White Honesty particularly! Thank you for sharing your lovely garden, Sarah! 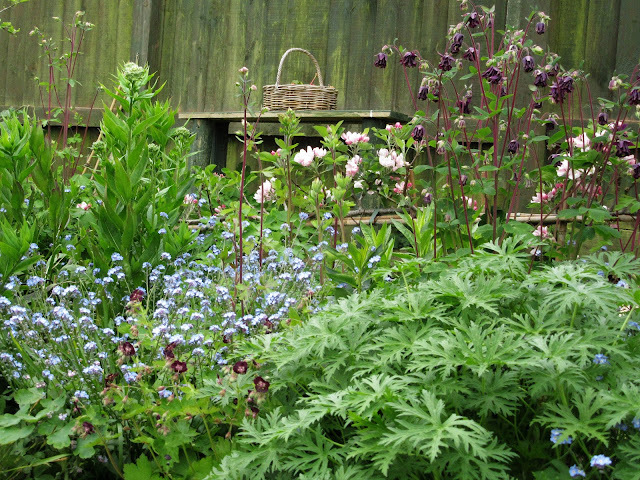 If I want my garden to look like yours [which I do] I need to get busy and plant more varieties of flowers closer together. I have found that our area welcomes Primroses which are in bloom a good many months of the year...even in winter. I am particularly enamored with my first pink Heliotrope even though it is a bit wonky shaped. Nothing is growing in my garden yet, Sarah. Soon I hope. Your garden is spectacular. Thank you for the lovely photos. They give me hope there may still be some blooming for us on its way although it surely doesn't feel like it at the moment. I particularly love your pergola! Your garden is coming along very nicely, Sarah, and I love seeing Tavi in it. Is the "glass" room an all-season room? It has a wonderful view of your arbor and gardens. Just beautiful. I'm the labourer in the garden and don't know a daisy from a dandelion, but our poppies have huge buds on them and I am looking forward to them coming out. Oh - and the Japanese maples have survived the frosts..! What a beautiful gate, I love it. Your garden looks like spring, yesterday we had a sunny day, today it will be rain, and we need it so much. Hope, that we get a lot of. Your garden is looking lovely, as surely only an English garden can, in spring. Your first photo looks just how I imagine The Secret Garden to look! 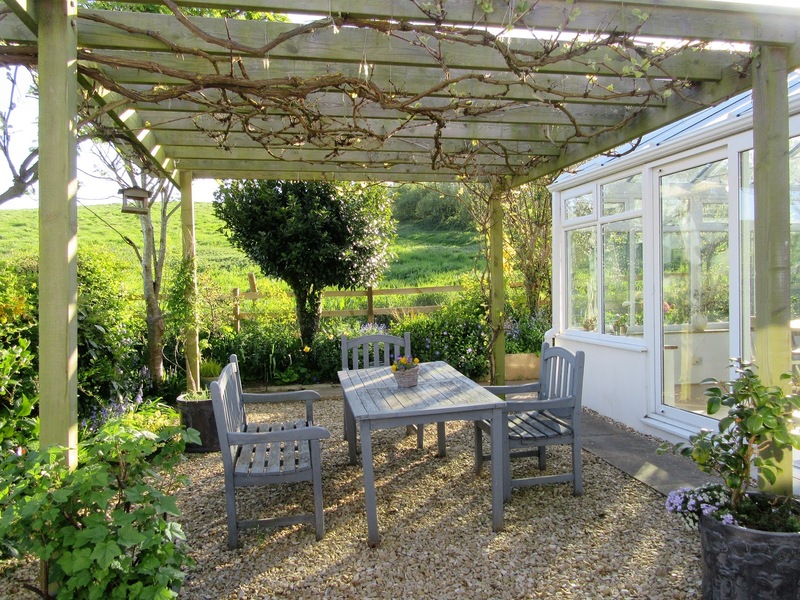 I love your pergola overlooking the fields beyond, what a lovely part of the world you live in...enjoy spring! PS ...and hi to lovely Tavi...I just love that dog! Have a great and sunny week, take care! 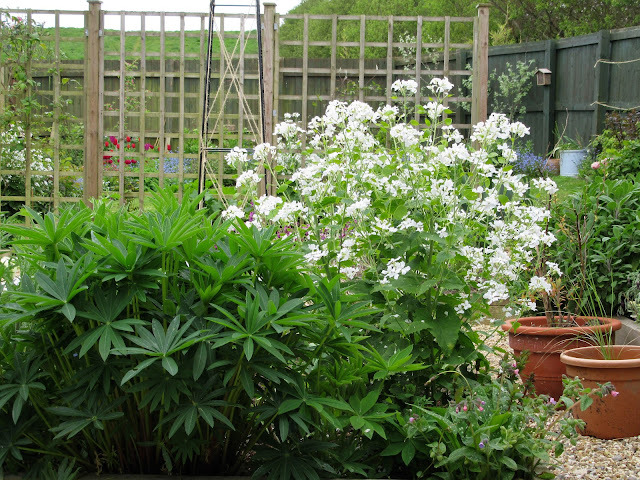 I love your garden - lovely pictures - I think you well ahead of us - my Aquilegia still only thinking it might come out! 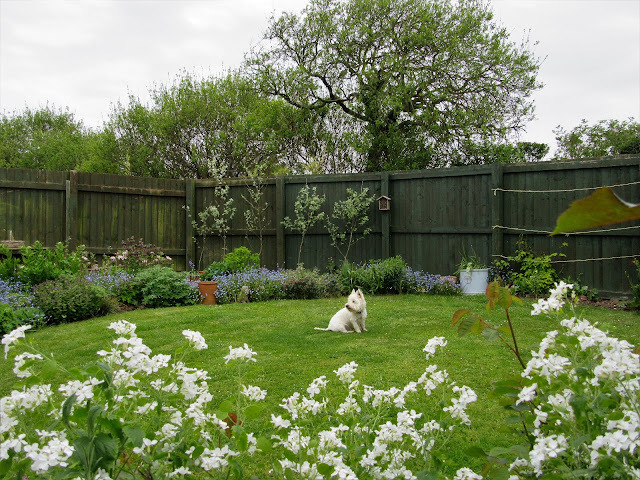 Hello Sarah - you must be delighted with the way your garden has developed over such a short period of time, it is looking lovely. I don't know where my Honesty has vanished to this year as I usally have loads of it. You have a great garden. Oh Sarah, your garden looks wonderful and I have so enjoyed my visit to your blog. Lovely to see Tavi in the photographs too. I love your pergola. And that Euphorbia! We are just getting our first blooms here, daffodils and grape hyacinths. But I'm so grateful that spring is here. That first photo is very Secret-Gardenish. 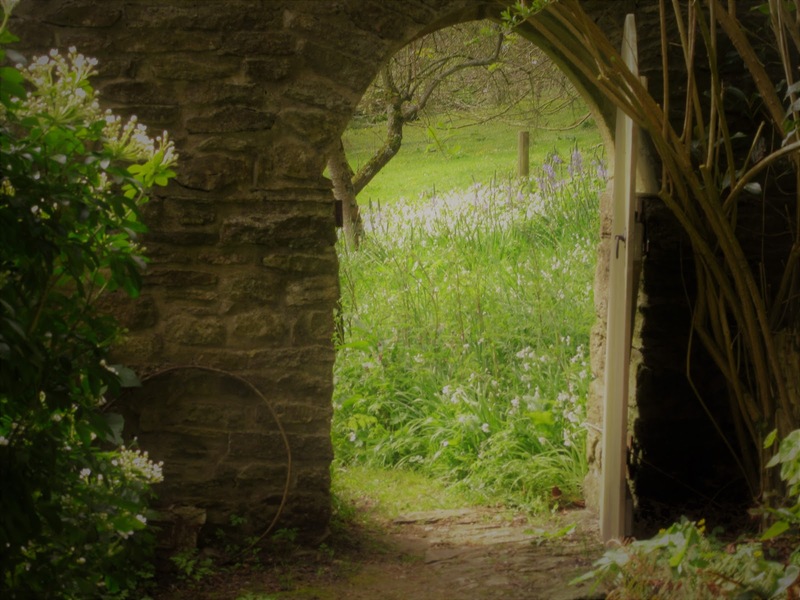 That book fired my imagination when I was young and I've loved walled gardens ever since. Your honesty is looking great. Thanks for adding me this month. I have been off line for just over a week but more on that in my next blog! 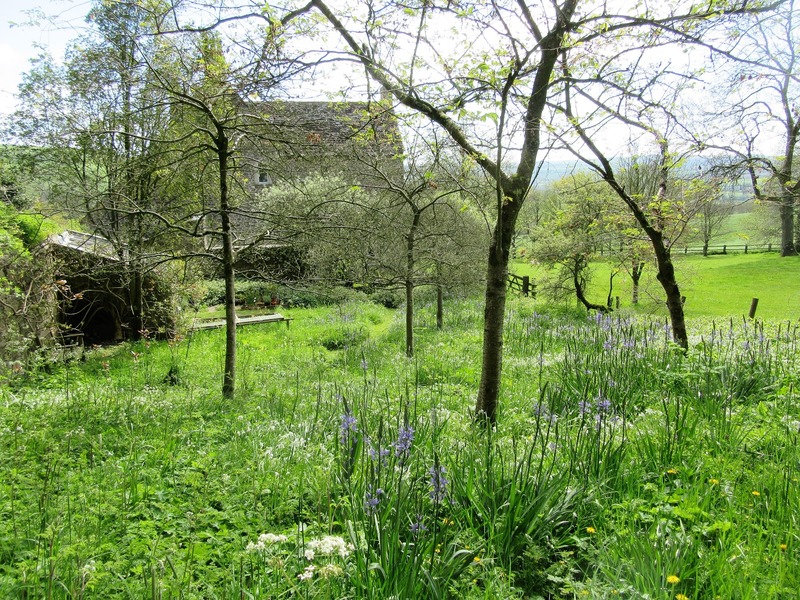 Your garden is wonderful, but Tavi is the show stopper! It's all looking so beautiful in your garden, Sarah. 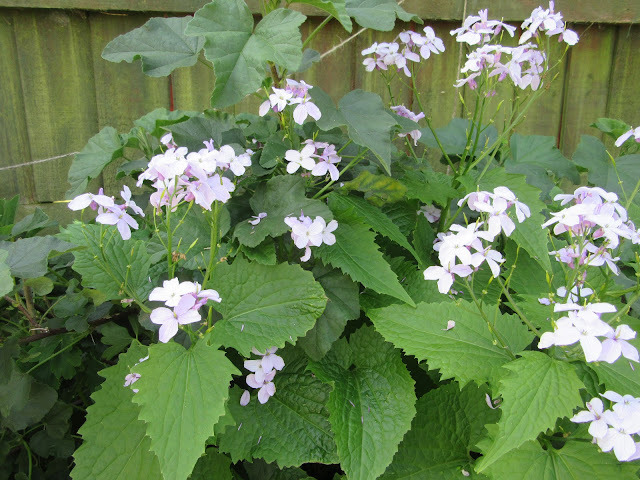 I must get some Lunaria for our garden - it's so pretty. Tavi is quite the model dog, isn't he?! Das war ein schöner Blick durchs Gartentor. Wunderschön ist das Rot der Tulpen und die Akeleien sind so besonders und sehr schön.